Innovative and individualistic, Aquarius is a humanitarian sign that beckons us to focus on social issues. A full moon in this sign encourages us to step out of our comfort zones, try new things without concern for what others might think and fight for just causes we believe in. This full moon is particularly complicated with an eclipse and six planets in retrograde, though I chose to focus on the latter in ritual rather than upon the altar. Instead, I wanted to keep this altar simple and direct. I began by placing the symbol of Aquarius - containers of water - upon the altar. The symbol of the Water Bearer is often linked with mythology. Greeks associated the constellation with the cup bearer for the gods, Ganymede and, going back further, Babylonians identified the stars as Ea, a god associated with an overflowing vessel of water. This particular pitcher was a perfect fit for Aquarius. When we see the pitcher associated with this sign, it often takes this shape! Despite its various associations with water, Aquarius is actually an air sign planted firmly with planets like Uranus and Saturn. The concept is that Water Bearer carries the water, but it is not the actual liquid itself. As such, Aquarius's associated animal is the eagle, thus making this large eagle feather decorated with airy swirls most appropriate for this altar. Across the feather lies a necklace of stone painted to match the same color as the altar contains: An airy sky blue associated with peace. Its chain is gold, much like other items on the altar that associates this sign with solar energy and air. I placed this necklace on this altar so it could charge with full moon energy. Aquarius's geomantic number is seven. To represent this, I included seven candles, ranging from tea lights to jar candles and even tapers. I used the same sky blue and golds replicated across the altar along with white for cleansing and balance, invoking these properties into the stone necklace. 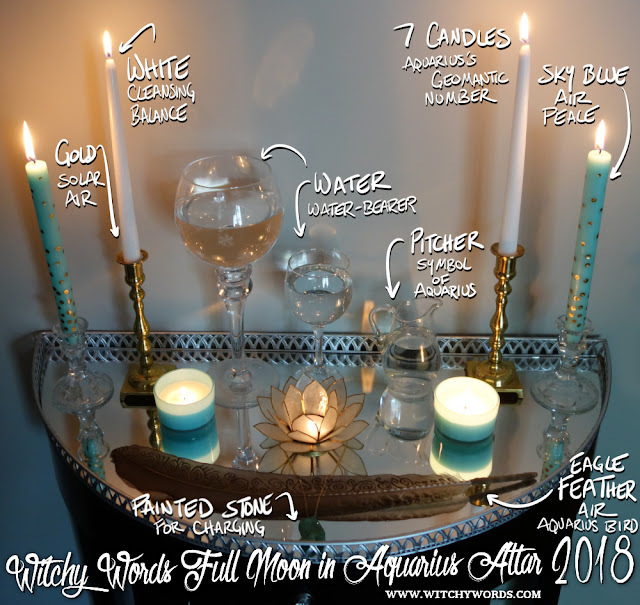 Overall, this was a simple altar with obvious Aquarius symbolism versus a more subtle approach. Still, the design is such that, if you weren't seeing it as an altar, you might mistake it for a decorative display. My goal is always to provide alternatives to the standard witchy altars for those who may not be open about their beliefs or are looking for something that blends with their home. I'll leave you with a full visual interpretation of the altar below. Best wishes to you this full moon! I think that is the most beautiful altar I've ever seen. Very inspiring. I've never created an altar based on astrology but I really like the concept. Of course, I might be partial because I'm an Aquarius. I have a static altar. You've inspired me to change it up! Thank you so much, Cynthia! I'm so glad I could help!